Days 11 & 12: Edmonton, AB. The half day of relaxing, recovery and planning we scheduled for Tuesday stretched into a full day as we spent most of the day in our hotel room devising an itinerary and booking reservations for the remainder of this trip. 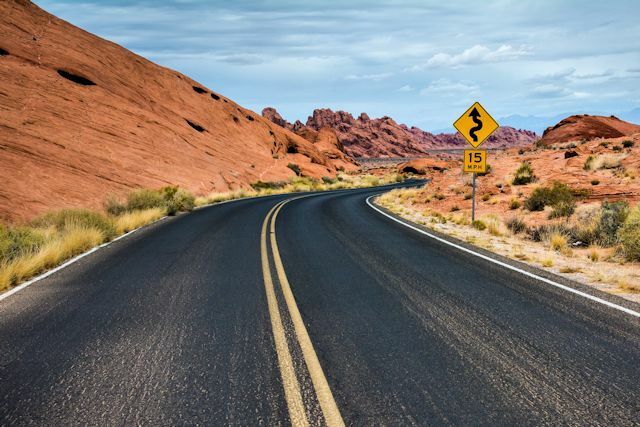 Since we have a commitment in early September, we must be home no later than the 9th, so our habit of meandering wherever the road happens to lead has to be restrained. 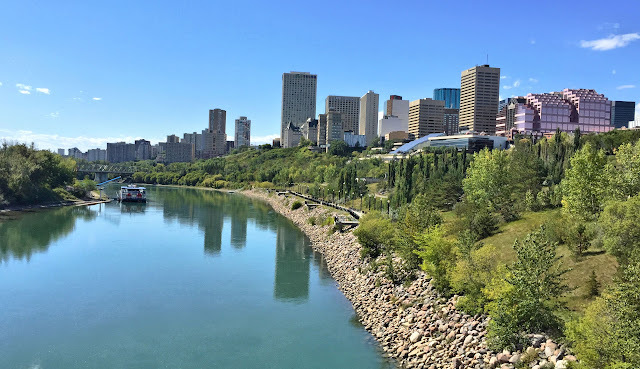 By Thursday we were ready to get out into the sunshine and explore Edmonton (pop. 877,926 – metro 1.3 million). 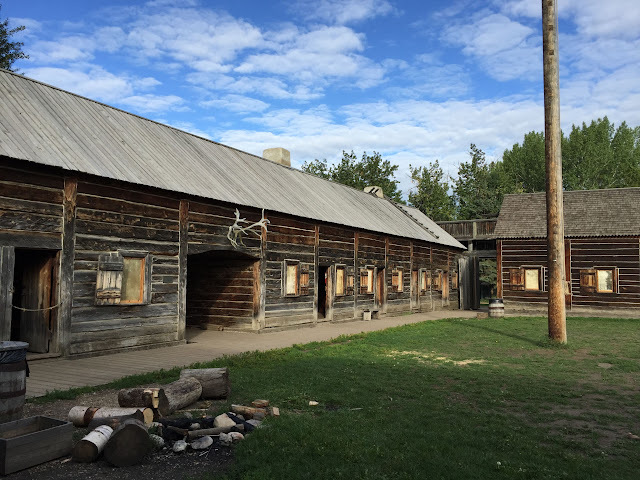 In the late 1700s, Hudson’s Bay Company—which is still a current brand in Canada—established Fort Edmonton on the banks of the North Saskatchewan River as a trading post. 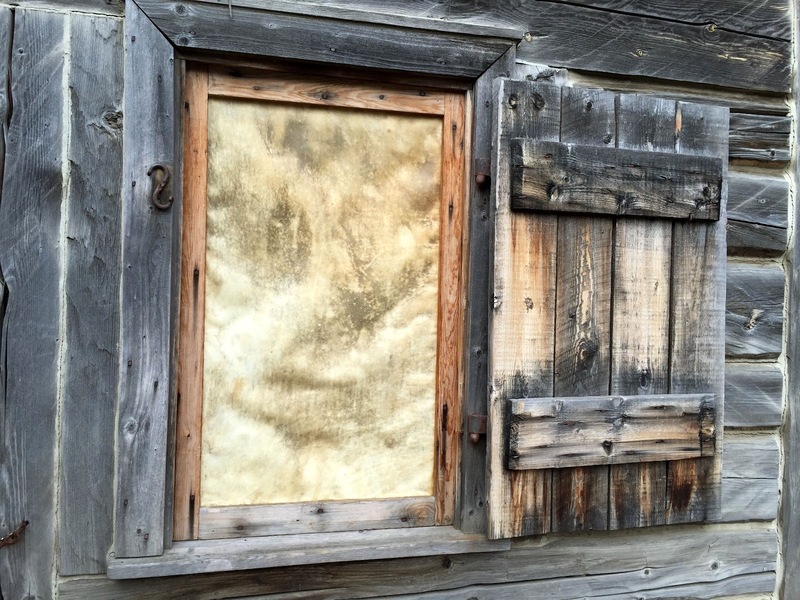 Company traders bartered with Cree and Blackfoot hunters for animal pelts. 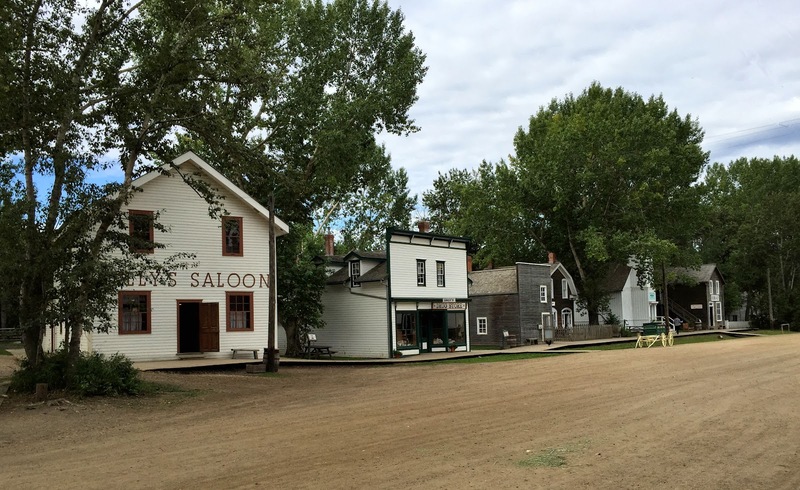 The town that grew up around the fort became a popular stop-off for pioneers heading north and west. 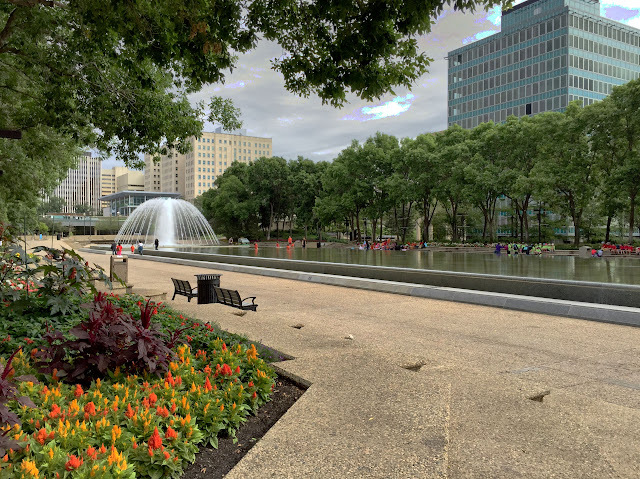 As an established supply post, Edmonton became a natural layover for prospectors to equip themselves before trudging north in search of fame and fortune in the Klondike Gold Rush of the late 19th century. When that didn’t “pan out,” many of the would-be miners returned to Edmonton and settled there, creating a major population boom. 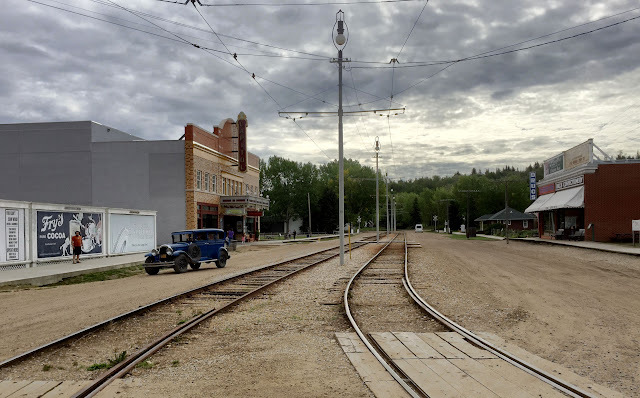 Edmonton continued to prosper as a rail crossroads until 1947, when a well 25 miles south of the city began gushing crude oil and changed the city’s fortunes and focus. 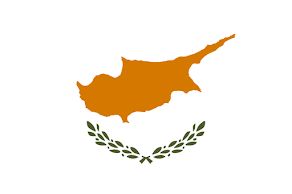 The discovery transformed the economy of the entire province, as oil and gas production replaced farming as the primary industry. As a result, the province became one of the richest in the country. Within a decade, Alberta was supplying all of Canada’s needs and eventually became a major oil exporter. 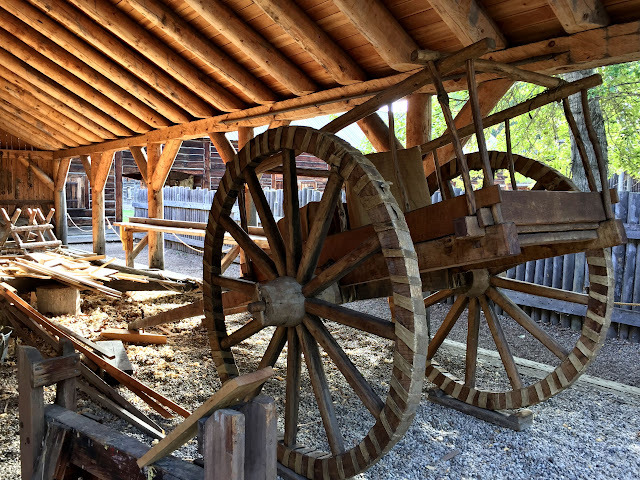 Our first stop of the day was Fort Edmonton, a living history park. When we arrived around 9:00, we followed a line of cars through a gate. The park is divided into four main sections by time period with historic reproductions of buildings and grounds appropriate to each era. Following the information on our car GPS, we drove to the back of the park to check out the 1846 fort. Based on all the cars we followed in, we were surprised to be the first car in the parking lot there. 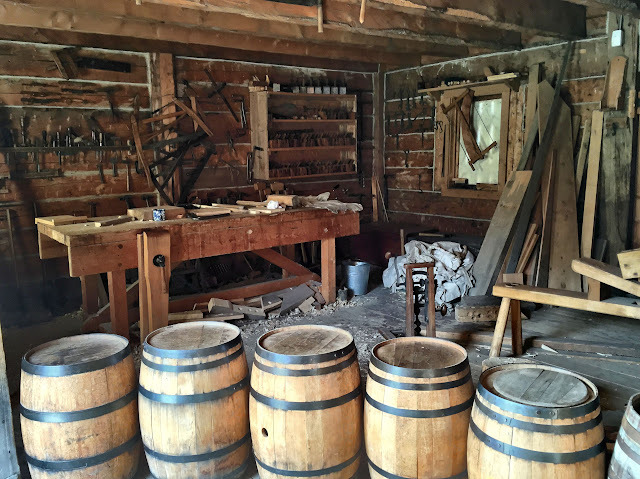 As we explored the residences, shops and other fort structures, we encountered a few people, surprised that none were in period costume as interpreters. Leaving the fort, we drove through sandy streets of the 1885 settlement and the 1905 municipal avenue, stopping just long enough to park and walk around exploring for a few minutes. Still we had not seen any living history guides and very few other visitors. We were a bit perplexed, given the number of people entering when we did. With a full agenda, we had decided to skip the 1920 street and old-fashioned carnival midway. While searching for the exit, we finally realized that we had been unknowingly driving around in restricted areas the entire time we had been in the park. As we slipped out of the “no visitor vehicle” zone into the public parking lot and headed off to our next destination, we consulted a discarded brochure we had picked up in the fort. That’s when we learned that: a) the park didn’t open until 10 a.m.; b) the line of cars we followed were employees going in the staff entrance; and c) we were supposed to pay an admission fee of $26 each. We considered going back to pay our debt, but there would have just been too much ‘splainin’ to do. We'll just mail the admission fee to the park anonymously. From our inadvertent break-in at Fort Edmonton Park, we headed over to the “Ledge,” Alberta’s Legislative Building. Perched on the north bank of the N. Saskatchewan River, the building occupies a spot where indigenous people (First Nations, as they are called in Canada) once camped and where early traders established the original Fort Edmonton. Parking for the Alberta Ledge was considerably more challenging than in Winnipeg or Regina, where we left our car a few yards from the entrances. Unable to locate visitor parking in lots nearest the building, we ventured into surrounding streets. As we were groping to find the entrance to a parkade (Canadian word for multi-level parking garage), a kindly security guard walked from his booth next to a federal building, took pity on us (maybe because of our Georgia license plate), and pointed us to a spot along the curb on a dead end street near his booth, next to what we suspected was his personal car. Not only was it free, it was less than a quarter mile to the Ledge. 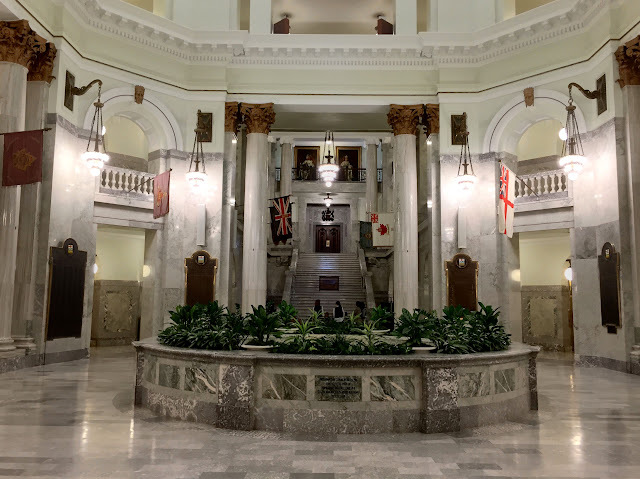 As we approached the building, it was immediately apparent that the Alberta Ledge is in a different league from the two statehouses we had already visited. 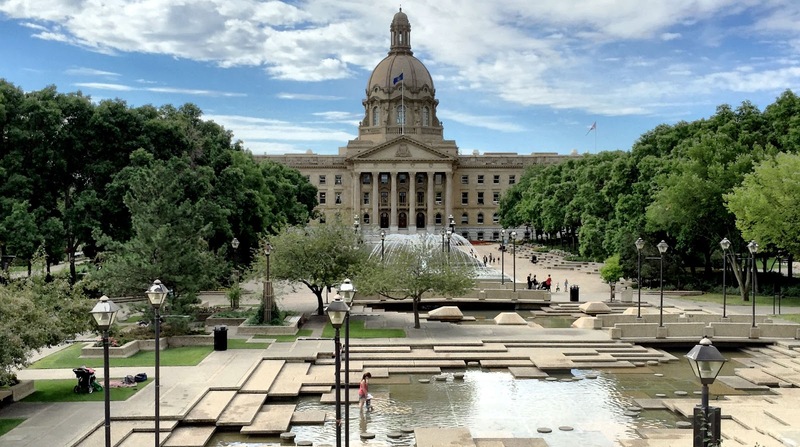 Though the legislative buildings in Manitoba and Saskatchewan had beautiful landscaping, Edmonton's building and its expansive well-dressed grounds had a majestic presence. Set amidst 57 acres of meticulously manicured park land, the building began to take form two years after Alberta and Saskatchewan broke away from the Northwest Territories in 1905 to become new provinces. Numerous monuments and dedication trees on the grounds honor individuals and groups important in the province’s history. Though the security into the building was the most structured we have seen at the three legislative buildings, complete with the standard bag x-ray and walk-through metal detector, outside the atmosphere was carefree. 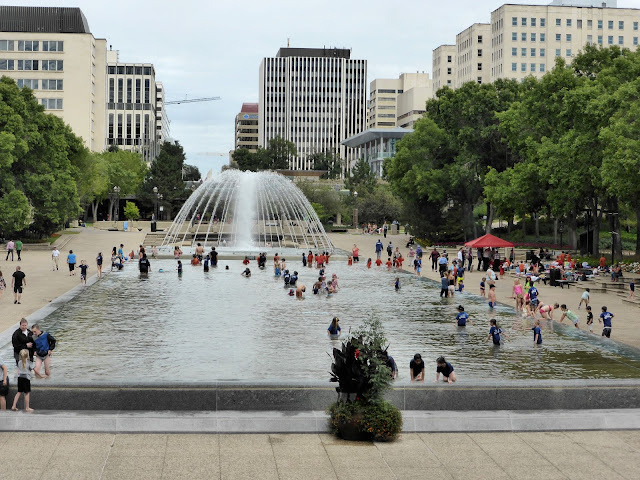 Numerous day camp groups of young children were visiting the park and the wading pool in front of the building was teeming with the little ones. 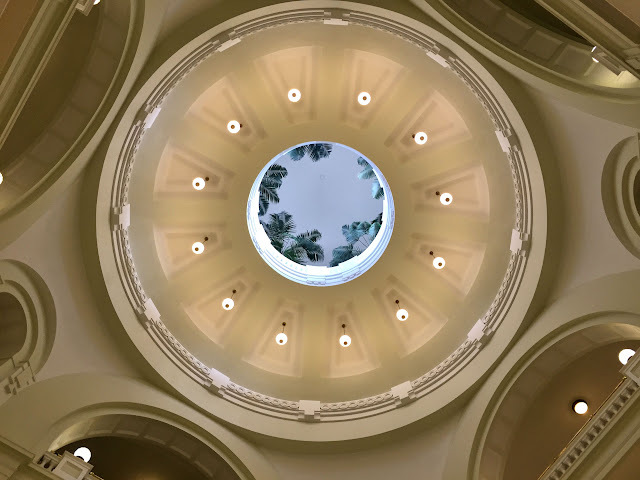 The rotunda features a fountain built to commemorate Queen Elizabeth's first visit to the building in 1959. Along with 16 or so other people, we caught the 11 o’clock guided tour with the very experienced docent Mary. She was one of half a dozen guides leading groups through the government house. It was bustling with activity even though the legislative assembly is on summer break. 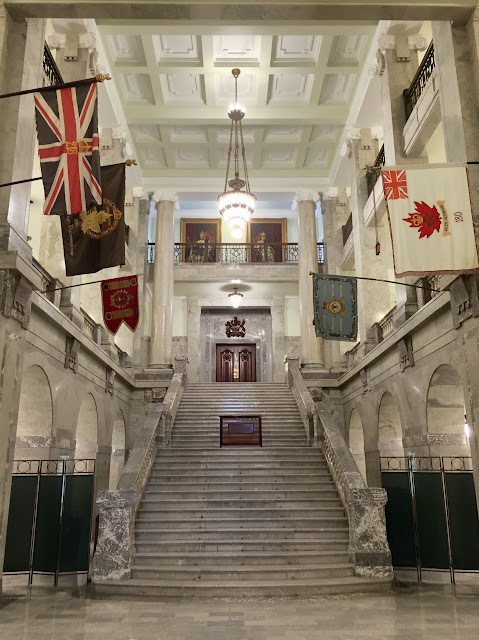 Like its neighbor Saskatchewan, Alberta had very few provincial symbols when the legislative building was designed, so emblems of the British royal family were employed. A few nods are also given to First Nations cultures—mostly the Cree and Blackfoot—who preceded Europeans in this area. 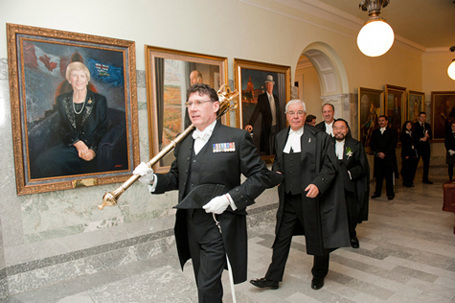 In the British parliamentary tradition, provincial legislatures in Canada utilize a mace—a highly ornamented ceremonial staff—as a symbol of the Speaker’s authority. At the beginning of each daily legislative session, members use a side entrance into the chamber and take their places before the sergeant-at-arms enters carrying the mace with great pomp through the main chamber door, followed by the Speaker. Typically made from precious metals encrusted with semiprecious jewels and decorated with iconic symbols meaningful to the province, the mace is set in a prominent place in the center of the chamber, where it must remain until the close of the meeting, when it is ceremoniously removed. In a radical break with tradition, the original mace used in the Alberta legislature came from much humbler beginnings. It seems that the task of obtaining a mace for the new province was overlooked in the hubbub of getting the new government organized. Just two weeks remained before the opening session of the legislative assembly when someone realized that Alberta had no mace. Without one, no official legislative business could be conducted. A Calgary jewelry company commissioned to bring forth a major ceremonial rod in just a fortnight engaged the services of one Rufus Butterworth, a creative pattern maker and carpenter. Butterworth was given free rein to incorporate whatever materials he could find that would give the staff the grandeur its station required. Thinking of the various shapes he would need to use, Butterworth collected a hodgepodge of household materials—a metal shaving mug, iron bed parts, a toilet float, doorknobs, and a plumbing pipe. With a heavy dose of ingenuity and a bit of gold paint, he devised an elegant mace in time for the initial legislative meeting. Intended as a temporary solution, the beloved mace continued to serve for nearly 50 years until a replacement was gifted to the province by a citizens group in 1955. Yelp pointed us to the Little Village food truck parked a few blocks from the Ledge, along with other mobile food purveyors. In quick order, we were outfitted with delicious falafel salads, fuel we would need for our next activity. We were searching for two letterboxes on the opposite side of the river from the legislative building. Our GPS seemed no more familiar with this part of the city than we were. Unable to figure out how to drive from the street elevation at the other end of the High Level Bridge down to the riverside, where the boxes were hidden, we parked the car and hiked down 700 feet on a two-mile multi-use trail. At the bottom—within 30 yards of the parking lot we didn’t know how to reach—we happily found both letterboxes, buoying our energy level for the climb back up to the car. Since it’s one of Edmonton’s top attractions, the Muttart Conservatory was our last sightseeing stop for the day. Four glass greenhouses shaped like pyramids are the heart of the conservancy. Three are devoted to different climates—tropical, temperate, and arid –while the fourth pyramid offers seasonal displays. Since the latter was closed during its transition to the next show, tickets were discounted 25%, a rare and thoughtful gesture. 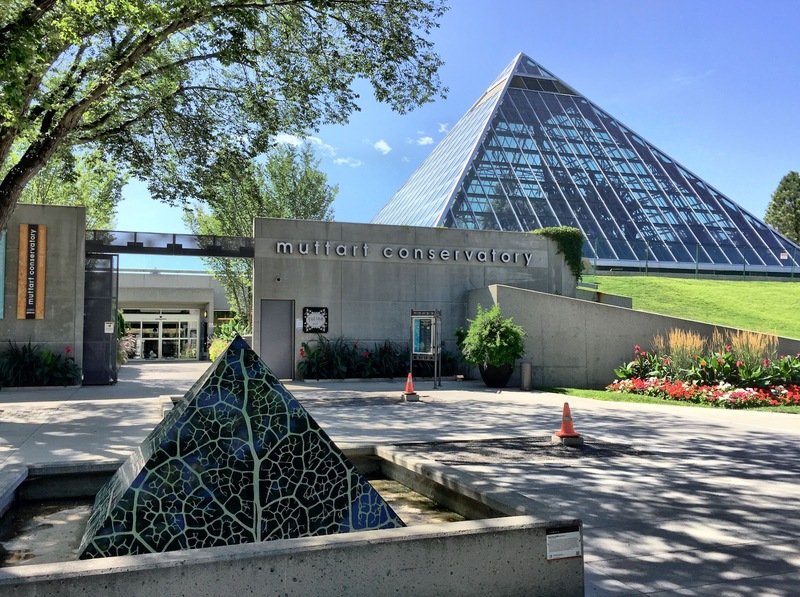 The variety and design of the climate exhibits were typical of similar collections elsewhere, with the unusual building form being all that distinguished the Muttart from other institutions we have visited. 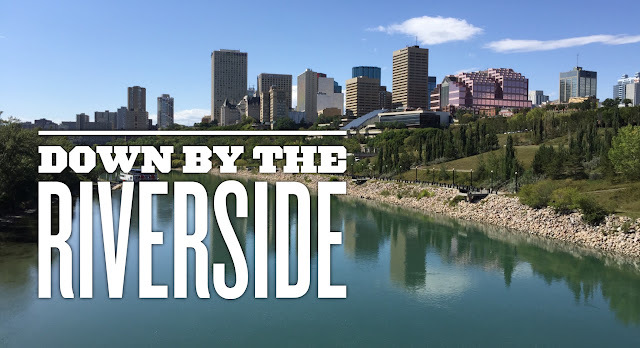 With two more letterboxes to search for in a park back on the north side of the river, we were again puzzling over where to leave the car when we chanced upon a small green space on the south side that might offer a nice view of the city skyline. When we walked onto the pedestrian bridge for an Edmonton photo op, we realized that our destination was at the other end of the bridge. Our parking conundrum solved, we walked across the river, found the boxes, and called it a day. Though its oil industry has fueled Edmonton’s growth and prosperity, the city has certainly not neglected its green spaces. Extending or 30 miles along both sides of the North Saskatchewan River as it winds through the city is continuous collection of more than 20 parks encompassing more than 18,000 acres, making it the largest stretch of urban parkland in North America. 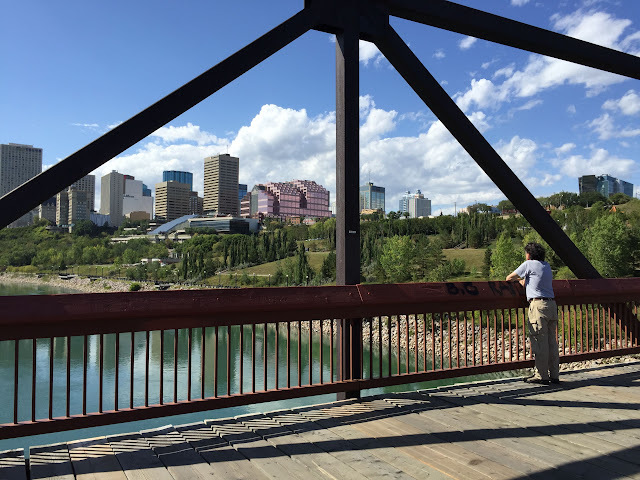 Typical of our experiences in Canada, our time in Edmonton has been very pleasant. Locals are friendly and helpful and seem to genuinely appreciate our visiting their city. This is as far north as we’ll travel on this trip. Tomorrow we’ll head west to Jasper National Park, pride of the Canadian Rockies. Animal skin windows let in light while protecting inhabitants from the elements. 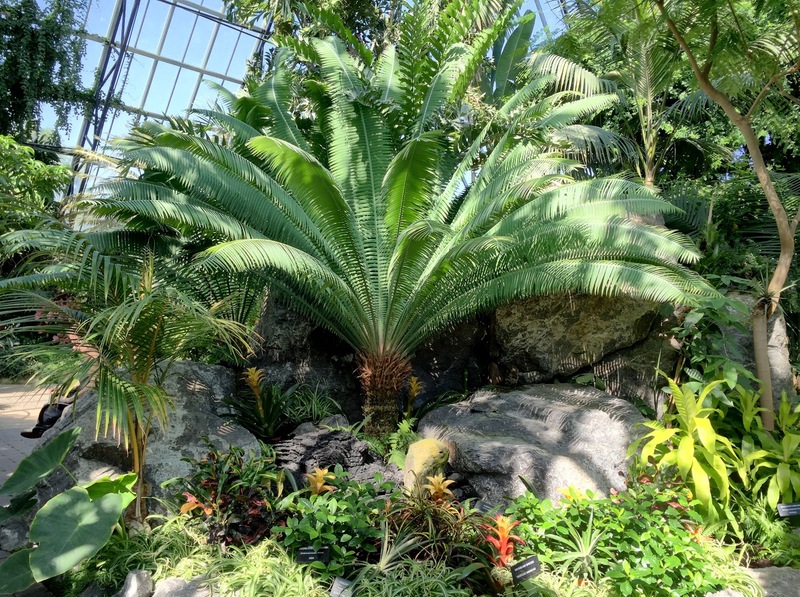 An unusual dome, open at the top to reveal 80-year-old potted palm trees on the upper floor.